Click on this link to visit The Sun news website to read their news post titled: “ACID HORROR Woman who was scarred for life when her ex-boyfriend hired a hitman to throw acid on her recalls watching her skin ‘drip to the floor“. Edmundo Fonseca, who threw the acid was told to throw it at her face. He did not. He also said “Sorry” before throwing the acid on Ellie Chessell’s body. In court he stated that he was deceived, because he was told that it was urine which he was to throw. Ellie’s Ex-Boyfriend Claudio Gouveia, had hired Edmundo to throw the acid after Ellie left the two-year old relationship. She went Go No Contact to the point of moving to a different city. Unfortunately her Ex-Boyfriend had refused to give Ellie her laptop and cell phone. She believes that he was able to track her down and monitor her using the cell phone. Please be careful out there. Ellie took the best option by trying to Go No Contact. Disordered Individuals can attack when they lose their source of Narcissistic Supply. If there was any violence during the relationship, please speak to your local Law Enforcement, even if you had not reported the violence when it had happened. At least in this case the Ex-Boyfriend Claudio Gouveia was charged and convicted with Attempted Murder and was sentenced to 12 years in jail. Ellie stated she now suffers from PTSD and is getting treatment. He body will be forever scarred. Thankfully the acid was not thrown directly in her face. If you decide to Go No Contact, then be prepared to Expect the Unexpected from the Narcissist. In a healthy relationship, partners naturally try to be there for each other. In the mind of a Disordered Individual, you are there to serve their own needs and your needs do not matter. In a healthy relationship there can be Open Dialague between the two partners. In a relationship with a Disordered Individual their monologue is what is important. They do NOT care to listen to what you have to say. I came across a great article which discusses what I would call 8 Red Flags to watch out for. Click on this link to visit the Lessons Learned in Life website to read their article titled: “Watch out: If a Man Does These 8 Things, He Doesn’t Truly Value You“. The Optimum Talent website’s Optimum Talks Blog has a superb post by Frances Sardone, titled: “You’ll Never Survive Working for a Narcissistic Leader – Here’s Why“.The last line in their post really struck home for me. It was: “Can you work for a Narcissist? No, you can’t. No one can and remain healthy.“. I recently walked out of a new job after “two weeks”, with what I considered to be a rather Malignant Narcissist Boss. It still bothers me that I did not pick up on any Narcissistic traits during the interview process. After 5 working days my eyes were opened. On the eighth working day, the Narcissist’s Mask came off and I got to meet the “Real Malignant Narcissist“. I have read other articles on major Business websites about working with a Narcissist Boss, which implied that you can change the Boss. Sorry, but I strongly disagree. IMHO, you cannot fix that which is hardwired differently in the brain of the Narcissist. One course of action which works, is to Go No Contact – Quit without notice and never come back. Click on this link to visit the Optimum Talent website to read their excellent article titled: “You’ll Never Survive Working for a Narcissistic Leader – Here’s Why“. Dr. Hamlin discusses How a Narcissistic Boss Causes Stress and Burnout. He also offers a few tips for how to cope with a Narcissistic Boss, so that you can protect yourself. Sharing the Truth of the Narcissist’s actions and you may think you are suddenly in episode of the Twilight Zone. Your reality will not be accepted by the Narcissist. This can occur within a personal relationship and also in a work environment with a Narcissistic Boss. If you create a Narcissistic Injury, then lookout as the Narcissist will twist things to Keep the Focus OFF OF The FACTS which you spoke about. They will switch to talking about and accuse you of things totally unrelated to what the original discussion was about. How dare you question the Narcissist. “Toxic Workplace & Narcissist Boss” is a video of an interview with Dr. Karlyn Borysenko, who is an Organizational Psychologist and Author and Performance Coach. She has made presentations at the South by Southwest® (SXSW®) Conference & Festival. I happened on this article which is well written and many ways mirrors my recent experience. She did not initially see that her Boss was a Narcissist. When her eyes were opened, she realized that he was not just Narcissistic, but was a rather Malignant Narcissist. She started to do research on Narcissism. Thankfully she had the support of family and friends, who kept suggesting that she quit her job. Finally she quit. She did not say anything to the Narcissist Boss. She quit and went Go No Contact. I found this to be a very good real life example of what it can be like, when one finds themselves working for a Malignant Narcissist Boss. The DSM 5 manual defines Narcissistic Injury as: “vulnerability in self-esteem which makes narcissistic people very sensitive to ‘injury’ from criticism or defeat. Although they may not show it outwardly, criticism may haunt these individuals and may leave them feeling humiliated, degraded, hollow and empty. They react with disdain, rage, or defiant counterattack.”. Click on this link to visit the Psychology Today website to read their article titled: “The Destructive Force of Narcissistic Injury“. Narcissistic Injury was first used by Sigmund Freud back in the 1920’s. 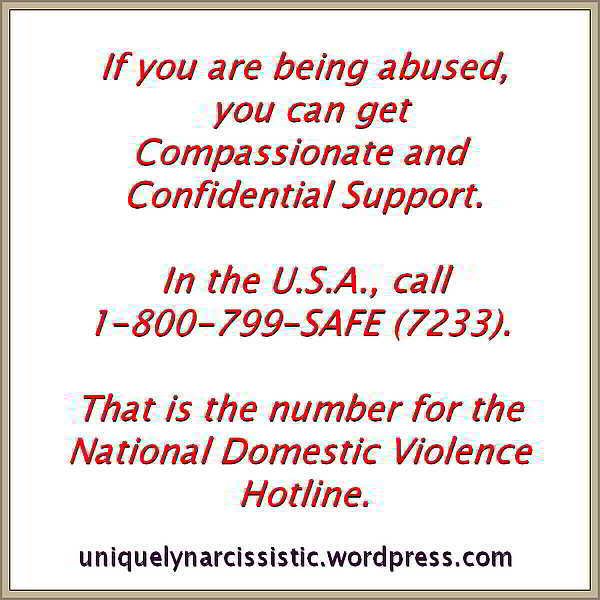 A Narcissistic Injury occurs when the Narcissist’s importance is brought into question. Click on this link to visit the WikiPedia page to read their post titled: “Narcissistic Rage and Narcissistic Injury“. 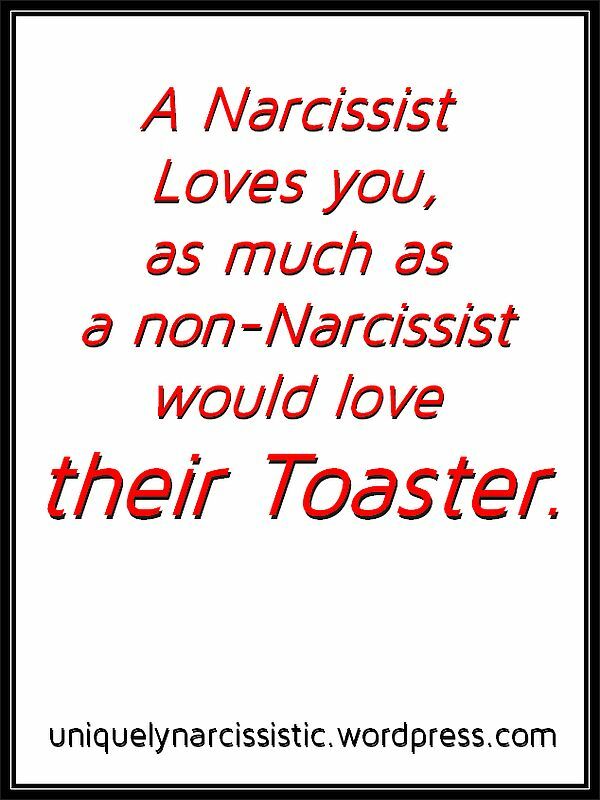 A Narcissistic Injury can also occur when a person does not accommodate a Narcissist’s insatiable need for constant Admiration and Praise. Click on this link to visit the PsychCentral website to read their article titled: “Narcissistic Injuries: What They Are and How to Protect Yourself from Them“. The Narcissist- Psychology of Demons from KJ Ozborne on Vimeo. How things can come full circle back to you. Discovered that my new job included a rather Malignant Narcissist Boss. I had set up this website to try to help others ( especially Empaths ) by providing information about Disordered individuals. One key was to try and spot the Red Flags. I have crossed paths was a variety of Narcissists. They ranged from being Covert to Overt to Malignant. I watch out for those Red Flags. Well things have come full circle for me recently. I got a new job. Surprised to find that my new Boss was imho a very Malignant Narcissist. During the interview process I did not pick up on that fact. Everything centered around him. I suspect that deep inside, he was rather insecure. There were team meetings several times a day which he would Lord over. That was not enough to feed his need for attention. Out of the blue he would interrupt to go into a diatribe. I quickly learned he could care less about boundaries. He would consistently multiple times a day trash and back stab the person who I was going to replace and who was training me. When that person left he would trash and back stab a guy who had worked for him for almost a decade. You don’t build a Team up by backstabbing Team members to other Team members. Of course this person could do no wrong. I heard from him that his ex-wife’s family were causing issues with the divorce. He worked on his ex-wife to try to get her not to listen to her own family members. A Narcissist will always try and isolate you from the support of family and friends. When there is a lack of support, then it becomes easier to manipulate and control that person. I felt sad for his ex-wife. She should have gone No Contact, but instead she still worked for the guy and saw him every day. Just think, I have just joined the Team and my Boss was backstabbing the person who was leaving. He was also backstabbing his ex-wife’s family and trying to get his ex-wife to stay away from her family. One day I get interrupted and asked to sit in on a conference meeting call. The conference call was run by the Boss and another Team member (the guy who had worked there for almost a decade). Totally pointless having me there, as I had just started working there. After the conference meeting, the other Team member left. Then the Boss started to trash and back stab him. He went into a rant about how the guy did not do this or do that during the conference meeting. This went on and on. I finally got fed up and stated some facts back to this Boss. I stated that both the Boss and the Team member were active participants in the conference meeting. If the Boss felt that something was being missed or left out, then the Boss should have added it to the meeting. It would have been a great learning experience for the other Team member who had participated in the meeting and also for me. Instead the Boss just sat there and did nothing. I stated facts. My facts did not go over well. I was immediately told not to tell the Boss how to run his company. Narcissists will never admit that they did anything wrong. At no time would I even try to tell him how to run his company. The Narcissist Boss was shifting the blame onto me. The new Boss was good at two things. Self praise and back stabbing the folks who worked for him. There was something which I was doing but also asked fellow Team members if it was okay with them. The Boss remarked to me that he owned everything and if he said it was Okay, then I did not need to ask anyone else. It is common courtesy to ask someone if they are ok with something. Not with this new Boss. He owned everything (and likely felt that he owned everyone there). I had not picked up on any Narcissist traits during the interview stage. As soon as I started working there then the Narcissist started to be displayed. My stating the fact that the Boss could have changed the conference meeting by filling in what may have been missed by the other Team member did not sit well with my new Boss. At the end of the day, he came over started discussing things again. He told me that I did not know what I was talking about and that I should shut up. Seriously. This was during my 2nd week. I restated that he could have added what ever he felt was being missed. Instead he did not. My words went in one ear and come the other. How dare I suggest that the almighty Boss had done such a thing. Again I was informed that I do not know anything and should keep my moth shut. Then he motioned his hand across his mouth like shutting a zipper. Great way to inspire a new hire – Me. The New Boss could care less about anyone else. He was the greatest. He was a member of an esteemed club which is attended by local High Rollers. There was a consistent need to brag or to try to impress upon me just how special the new Boss was. I saw this as him having major insecurity issues. Narcissists pretend that they are the greatest and the very best, yet deep inside they are very insecure. What struck me about the late discussion where I was literally told to keep my mouth shut, was that I did not pickup on the fact that he was “Gaslighting me”. There was also another senior Team member still there. My new Boss was in effect backstabbing me to that other person. All because I stated a fact that he could have done something, but did nothing. It was not till later when I got home that I realized that he was Gaslighting the situation. Yes I was new and Yes I did not know much about the job as yet. But I was present during the conference meeting and I was stating facts. He could not handle facts. So he started to use Gaslighting. First I was told not to tell him how to run his company. I never did that. Next he tells me to keep my mouth shut. Implicit instruction to never state the truth as in the new Bosses mind he can do no wrong because he is the greatest and most knowledgeable etc etc etc. I have managed large departments and would never dream of back stabbing those who report to me. I once refused to fire someone. The VP of Finance decided that he did not like one member of my Team and he told the Director who told me to fire the person. I said no. I also said that the person they wanted me to fire was great member of our Team and an asset to the company. I spent time working with the person and changed processes which got the VP of Finance off my back. I did not fire the person. You build a Team and should stand up and support it. Back to my new job. In two weeks my world got turned upside down. I felt that I was working for a rather Malignant Narcissist. I also better understood the concept of Trauma Bonding and why people do not leave dysfunctional relationships. For example, it did not dawn on me that my new Boss was using Gaslighting, at time that he was using it. It was only when I got home and out of the situation that I realized. There is one solution to dealing with Malignant Narcissists which I believed worked. That was to go No Contact. After 2 weeks I had more than enough. I quit and walked out. I will not work for a Malignant Narcissist. I have dealt with Directors and Vice President and Presidents of companies. A number of people had certain Narcissistic traits. But when you indicated that you were not going to be their source of Narcissistic Supply, they caught on and left me alone to do my job. This new Boss was different. No way was he going to leave anyone alone. He needed his attention fix multiple times each day – not unlike a drug addict. It bothered me that I did not pickup up on any Narcissistic traits during the interview process. He seemed quite normal. Up until the time I stated the fact that the new Boss was an active participant on the conference meeting and could have done something to fix that meeting, he would call me into his office. I was always told that he would normally not spend so much of his oh so precious time with an employee. I later took that as a form or Love Bombing. Getting lots of attention thrown my way. When I dared open my mouth and state facts that the new Boss was an active participant on that conference meeting, then things changed. No more love bombing. I was told that I do not know what I was talking about and to keep my mouth shut. I also got what I took to be a threat. He said after telling me to shut up that maybe I no longer wanted to work there. Great way to inspire and onboard a new hire – NOT. The Narcissist’s mask had come off and now I got to meet the real new Boss. I kept my mouth shut. Came and worked two more days. Did not say anything. Then on the Monday, at the start of the 3rd week I came in early. Cleaned up my laptops. Packed up my stuff. Got someone in accounting to confirm that they could get into the laptops. Handed the accountant my office keys and left before most of the staff arrived. Sent a msg saying that I quit effective immediately. It was an experience. I learned a lot while keeping this website going. That info helped me in this situation. I knew who and what I was dealing with. I have never had a Boss like this. I have never had an onboarding experience like this. I learned a lot from this. The Narcissist played me till I agreed to work for him. He picked up on my being an Empath. It was only when the Narcissist’s Mask came off that I got to meet the real Boss. I quit and will stay No Contact. There was even a Flying Monkey who would gladly do the Bosses bidding. The New Boss would reward them by providing them with attention at the end of the day. It is one thing to read about Malignant Narcissists. It is quite another experiencing them in real life. Because of the time spent building this this website I had the knowledge to know what I was dealing with and what to expect. So things have come full circle. Next up is trying to find another job. The job which I had left to join the Narcissist, I could go back to. I was told that the door is always open. Yes, by quitting it is costing me. My sanity is far more important than working for and being used and abused by a Malignant Narcissist Boss. The judge stated the obvious that the man showed an astounding Lack of Empathy. In the discussion with the Judge, the man starts to Gaslight the Judge and states that he did not mean to do that. Then he blames the his girlfriend. He stated that his girlfriend pushed him to do what his did. The Judge responded with “So, You are the victim?”. Click on this link to visit the Miami Herald website to read their News Article titled “‘You lit her on fire!’ Miami judge scolds man who torched girlfriend to death“. Listen to the video and how the wife beater make excuses. He plays the cat and mouse game. He admits that he did wrong, then does not and makes excuses. The video shot by his son shows that he threw his wife to the ground. Yet he states that he just wanted to give her a hug. He would not admit throwing her to the ground. Shoots back with a question: “Did I throw her to the ground?”. He tries to shift the blame to the victim by saying that he does not know what his wife has said. Yet the video clearly shows him throwing his wife to the ground. He thinks that there is no difference between saying that he repeatedly punched his wife in the head and giving her “taps”. He says that gave his wife “a couple of taps in the bathroom“. Changes the situation to be the fault of the wife. He was asked if he believes that he was a “Monster”. He comes back saying that no he is not. A Malignant Narcissist will not admit that they did anything wrong. He says that he just “tapped” his wife, yet there is photo in the video of his wife with two black eyes. One must assume that to him it was OK to just “tap” his wife and that it was his wife’s fault that she ended up with two black eyes. IMHO you cannot heal or change a Malignant Narcissist. IMHO, the best protection is to Go No Contact and work with the local Police and the Legal Courts. This is a start. If someone had been charged with Domestic Violence in the past, then they will be barred from coming to Australia. Click on this link to visit the France 24 website to view their article titled “Australia to bar visitors with domestic violence convictions“. “Lorena,” a four-part, Jordan Peele-produced documentary that will debut on Amazon Prime Video on Feb. 15. Video is courtesy of the Sean Buranahiran – ฌอน บูรณะหิรัญ YouTube Channel. Written by Admin Posted in Sean Buranahiran, What is the value of YOUR Life? Tagged with Sean Buranahiran, What is the value of YOUR Life?